Neurodegeneration is the progressive loss of structure and function of neurons, including death of neurons and homeostasis of glia, leading to cognitive disability, including dementia. Among other causes, neurodegenerative diseases can occur due to age (Alzheimer’s disease (AD), Parkinson’s disease (PD) or genetic mutations affecting CNS cell function (Huntington’s disease, early onset AD or PD, amyotrophic lateral sclerosis (ALS)). The pathological hallmarks of AD are plaques and tangles within the brain. Plaques are composed of amyloid beta proteins, as well as others, and tangles are mainly composed of hyperphosporylated tau protein. Identification of the proteins responsible for disease has allowed the development of specific antibodies. In research settings, these products play a major role in assessing the expression and deposition of amyloid beta and tau and other proteins involved in the progression of neurodegenerative disease. A global public health burden is on the horizon as AD affects approximately 50 million people worldwide, with expectations of steady growth over the next decade. 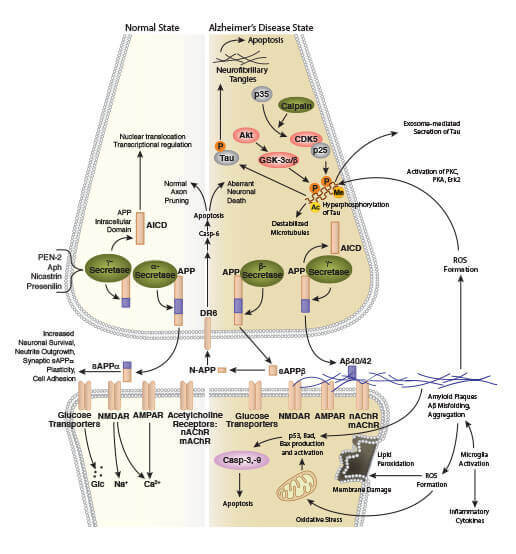 AD exhibits characteristic protein aggregation into neurofibrillary tangles and plaques, neuronal and glial cell death, and impaired cognitive function as a result of aging or genetic mutation. In these disease states, chronic inflammation occurs as a response to aggregated proteins in tangles and plaques or other stimuli. This neuroinflammation contributes to the demise of cells including neurons, astrocytes, and oligodendrocytes, and progression of disease. While there is no cure for AD, targeting the specific genetic mutation and protein products known to be involved in disease progression is an area of intense therapeutic research. Parkinson’s disease (PD), a disease of dysfunctional motor and eventually cognitive skills, also has an age and genetic basis, with a more complex aggregation of protein compared to AD. While most cases of PD are idiopathic, some have known genetic mutations thereby complicating the search for novel therapeutics. 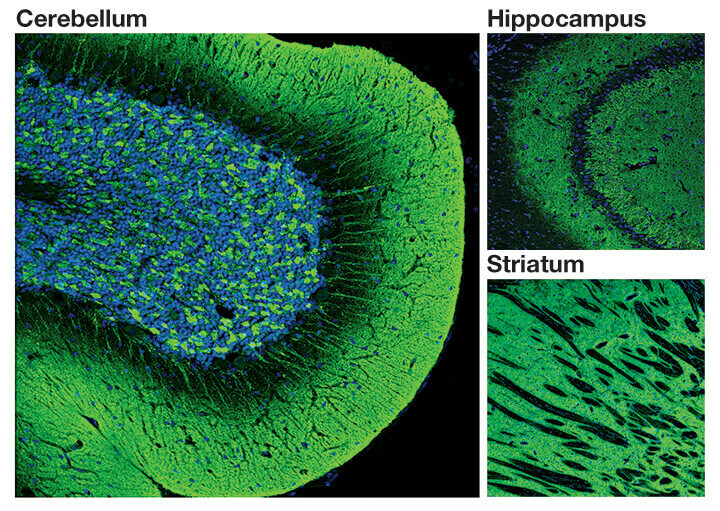 Confocal immunofluorescent analysis of normal rat cerebellum, hippocampus and striatum using α-Synuclein (D37A6) XP® Rabbit mAb #4179 (green). Blue pseudocolor = DRAQ5® #4084 (fluorescent DNA dye). IF image of #4179: Confocal immunofluorescent analysis of normal rat cerebellum, hippocampus and striatum using α-Synuclein (D37A6) XP® Rabbit mAb #4179 (green). Blue pseudocolor = DRAQ5® #4084 (fluorescent DNA dye). Multiple sclerosis occurs as a result of an immune system attack on the surrounding myelin sheaths of neurons both in the brain and the spinal cord. This leads to poor communication between neurons and weakening of the axons. MS manifests as deteriorating physical ability and can also cause changes in vision, pain processing, and speech. While gender, race, and the environment are risk factors for the development of MS, the exact cause remains unknown. MRI studies serve as a biomarker for MS. The availability of a biomarker enabled the successful development of disease modifying therapies. Amyotrophic lateral sclerosis (ALS) affects the motor neurons in the brain and spinal cord resulting in degeneration and death of this cell population. Patients with ALS eventually lose the ability to speak, move, and breathe. Although the causal links of ALS remain unknown, specific mutations are associated with disease development and is an area of intense research. Huntington’s disease (HD) is a fatal neurodegenerative disorder characterized by psychiatric, cognitive, and motor dysfunction. The genetic analysis of HD has been the flagship study of inherited neurological diseases from initial chromosomal localization to identification of the Huntingtin gene. It has been demonstrated that the increase of CAG repeats beyond 34 can result in disease onset in affected individuals. 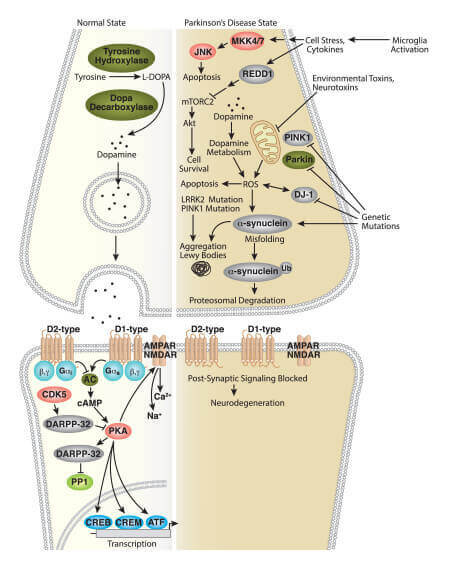 Mutant huntingtin protein can aggregate, exert negative effects on mitochondrial function and metabolism, and suppress expression of trophic factors including brain-derived neurotrophic factor (BDNF). Protein Misfolding and Aggregation - aggregation of misfolded proteins leads to neurofibrillary tangles and plaques that result in cytotoxicity of neuronal cells. Neuroinflammation - inflammation of the CNS in response to signals such as toxic insult (e.g. protein aggregates), infection, traumatic injury or autoimmunity. The immune system (microglia, macrophages) and astrocytes attempt to remove an injurious stimulus in the CNS to protect the function of the brain. 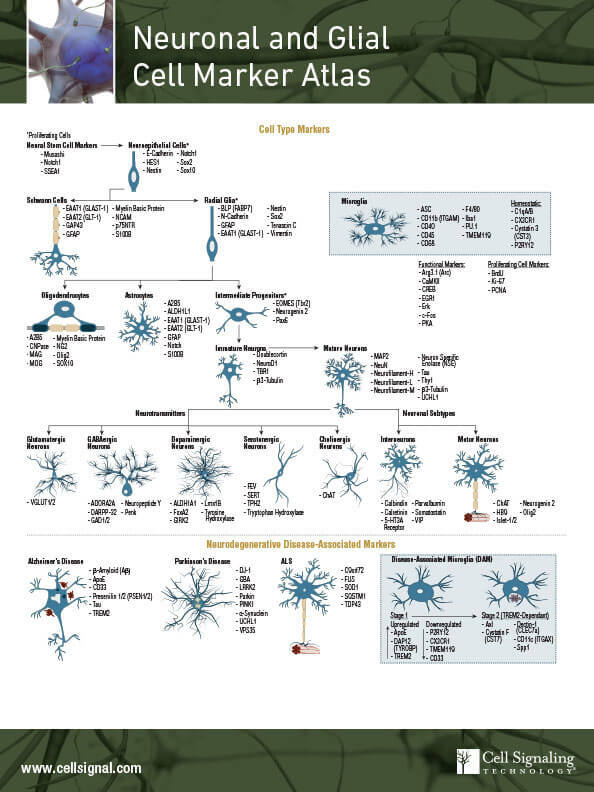 This process may be dysfunctional in neurodegenerative diseases. 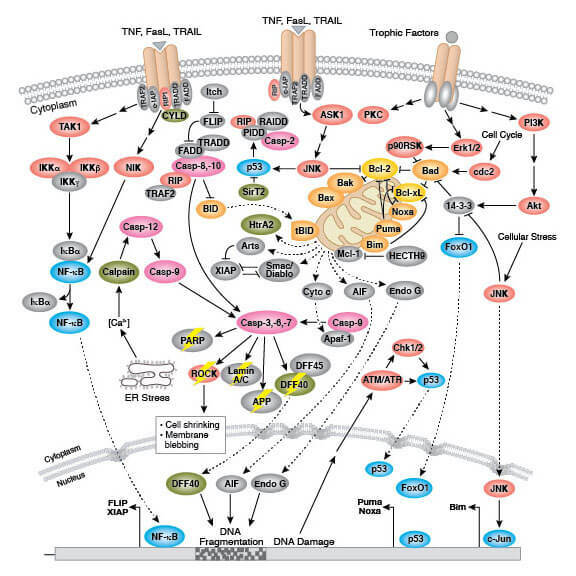 Altered Cell Signaling - recent research suggests that abnormal cell-cell communication, for example disrupted presynaptic input, as well as disrupted intracellular signaling contributes to the pathogenesis of neurodegenerative disease. 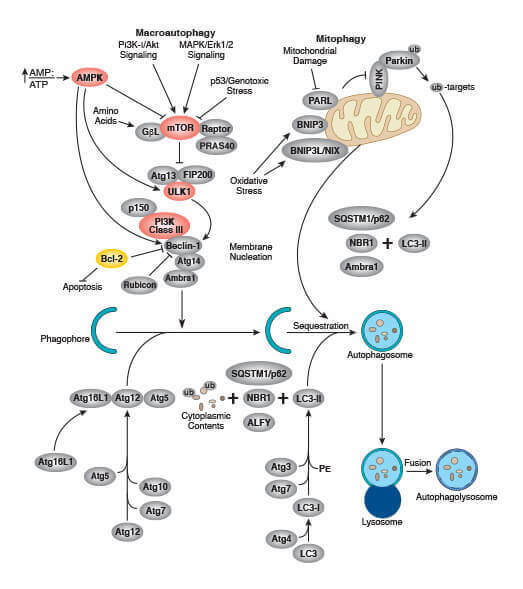 Acquiring Senescence/Cell Death - Mutations in proteins involved in the pathways of cell death including apoptosis, necroptosis, and autophagy are related to progression of neurodegenerative diseases. Disrupted apoptotic signaling, mitochondrial dysfunction, impaired autophagy, and activation of the necrosome by stress/inflammation are just a few factors that contribute to neuronal cell death. Impaired Cell Motility - Recent studies have demonstrated that several proteins involved in AD are linked to the regulation of neuronal migration. Continued research is required to determine the extent to which impaired cell motility drives neurodegenerative disease. Furthermore, a better understanding of how immune cells migrate to plaques or areas of inflammation is required. Epigenetics - DNA methylation and histone modification have recently been linked to AD and PD, but exact effects on disease are unclear. Modifications to the environment and targeting sites of potential risk for epigenetic changes is a growing area in the development of therapies against neurodegeneration.